SalsaGente and the City of Santa Cruz Parks&Rec is back with this popular series class beginning today. regular Salsa class using Cuban-style techniques. The goal is for you to shine on the dance floor! NO PARTNER REQUIRED. This series class builds from week to week, so attendance to all sessions is REQUIRED. Get a good workout as Chris and Jessica keep you moving! Offered through City of Santa Cruz Parks and Recreation. July 11- Aug 18. 7-8 pm. $43 for Santa Cruz Residents, $53 otherwise. TWO-FOR-ONE whenever you come! Students $2! They are back with COOL MOVES to HOT TUNES! This is a weekly drop-in class for intermediate salsa dancers. This is NOT a Rueda style class. This class will focus on Cuban style of dancing salsa. Join in to increase your repertoire of dance moves. Please note that this is NOT a Rueda class. If you are not sure of your skill level, feel free to contact Chris or Jessica at SalsaGente. Special Intro in July /Aug : just $6, students $2 (full-time students with valid ID)! Regular: $8/$2 students. Louden Nelson Center, Downtown Santa Cruz. 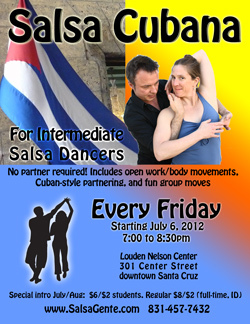 Offered by www.SalsaGente.com, 831.457.7432, Cuban-style Salsa dancing, serving communities since 2001.